When it comes to fighting against the ubiquity of internet shopping, James Brown, founder of hip clothing boutique Hostem, is certainly putting up a good fight. 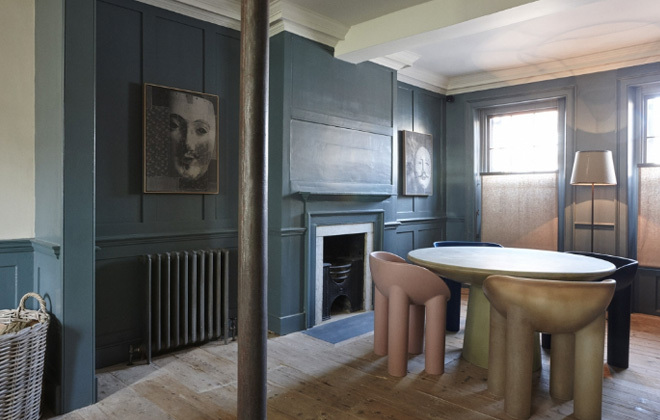 After the the success of his impeccably curated Shoreditch clothing shop, Brown decided he wanted to find a new way to present his furniture and home goods selections, which lead to the opening of his latest concept store: The New Road Residence. 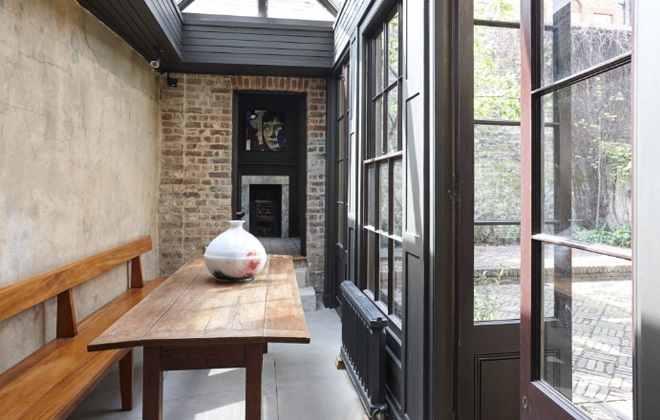 It is a classic East London home in Whitechapel, that is decorated with a selection of high end furnishings. 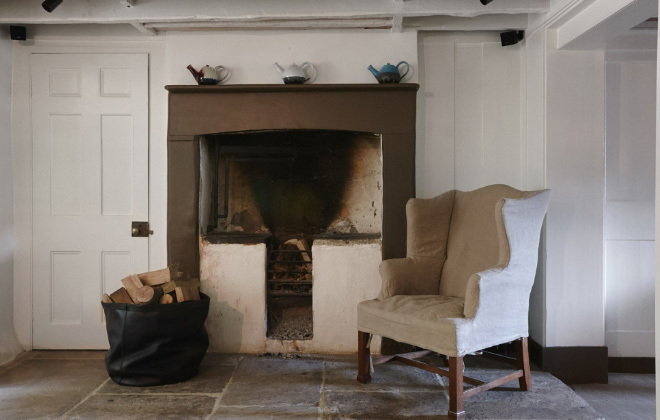 Here’s the twist – the house serves not only as a showroom for all of the items, which are for sale, but also as a curated guest house that can be rented out for up to six people! Genius. 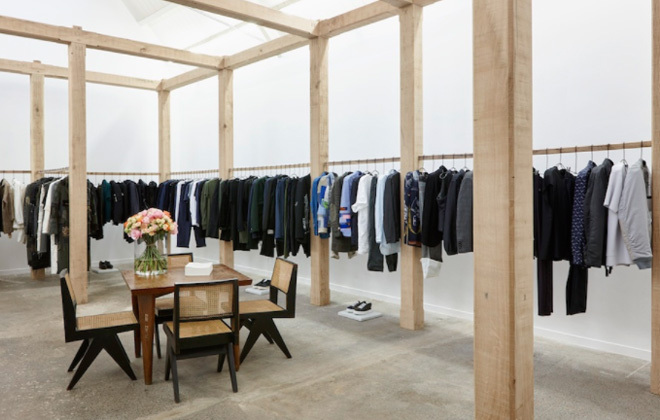 The utterly chic and minimal interiors of Hostem boutique in London. This novel idea came from wanting a more natural outlet for home goods and furniture than the traditional boutique. Just as people can come in a try on clothing in the Hostem store, the “curated house” makes it possible for people to come in and “try on” the lifestyle offered at the New Road Residence, giving them the chance to live in the furniture and cook with the home wares. Then at the end of the stay they can buy anything they like! 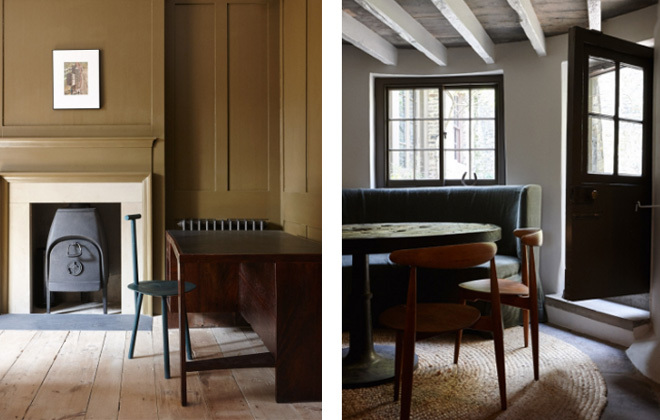 The East London House was originally built in 1797 and renovated by previous owners, but the creative team behind Hostem added their own updated chic interiors, along with a new kitchen, renovated brass fixture bathrooms, and of course a host of amazingly curated top notch design objects and furniture from designers like: Max Lamb, Faye Toogood, Pierre Jeanneret, Haeckels botanical skincare range, French-made Crane cookware, Skye Corewijn’s Lazy Eye ceramic crockery, Blackcreek Mercantile wooden tableware, and Austrian crystal by J. & L. Lobmeyr. It sounds like my idea of heaven. I love this sunroom leading out the sweet little patio! 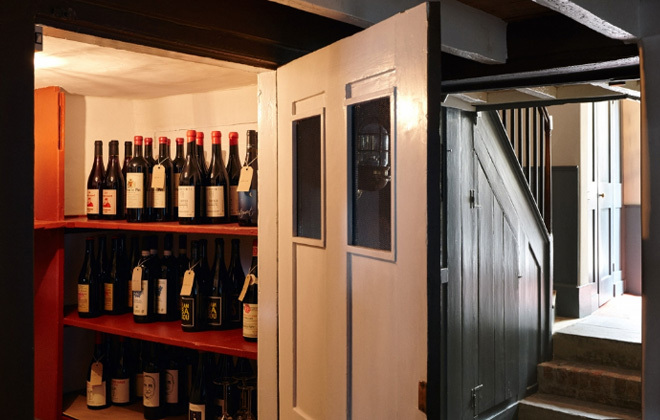 Fully stocked wine cellar? Yes, please! There is also the “lifestyle mini bar,” which was an old powder room renovated to serve as an in-house market, fully stocked with all the lifestyle products they sell. And if that wasn’t enough, how about a fully stocked library and wine cellar. What more could you need for your authentic London getaway? Pack your bags!